Update Notes / Updates March 22nd 2019 - Double Experience Weekend: April 5th through 8th! Patch notes updated with fixes of today. Update Notes / Updates March 3rd 2019 - PvP Balancing, Surge Spells and Prayer Improvements! In this update I am cleaning up some balancing issues with PvP, improved overall rendering performance and introduce you to new potions. I've reviewed eating speeds, prayer drain rates, enchanted bolt effects, the Revenants cave and our Music Manager. Some special attacks have also been reworked or buffed to be more useful and less frustrating. Revenants no longer drop third-age pieces. These drops been moved to Gulegas and Wildywyrms. Wielding a statuette won't let you teleport anymore. You need to walk out of wilderness to secure the drop. I've also changed the way PvP protection prayers work. Rather than applying the protection effect when the hit lands on you, it'll now be calculated when the enemy attack animation starts. This change isn't final, but we are trying out if this works better for PvP. This is also how protection prayers work in OSRS. Damage soaking effects are now also applied when the attack animation starts. This also counts for NPCs with protection prayers: KQ, Corporeal beast and Tormented demons. This change should ensure that your experience drops always reflect your damage. Let me know if you still find scenarios where this does not work. I've reviewed our current eating / healing code and compared it to OSRS. I don't think there is a problem with the amount you can heal in a certain amount of time. It enables reactionary gameplay without being out-damaged by some unlucky numbers that leave you no counter play. However I do think that consecutive healing should have a little punishment. That's what I could also find in how OSRS handles healing - they simply delay your attacks. This was already done in emps, but the punishing attack delay only applied when you were about to hit. So if you just hit your opponent and healed up your outgoing damage would not be affected at all. I am now always applying this punishing attack delay. Eating any kind of food puts a 3 tick (=1.5 seconds) delay on your next attack no matter what your current attack timer may be. This does NOT AFFECT the amount of food you can consume or the speed at which you do. This is a change to your dps while healing and not your healing power! The delay for brews is only 1 tick (=0.5 seconds). If you combine a brew with any other type of food it will still be 3 ticks though. Purple sweets have an eating delay of 1 tick. Large rendering distances required enormous CPU power, because every single tile (a position where your character can stand on) was marked to be drawn for the GPU. I'm now grouping 8x8 tiles together and decide if they all need to be rendered or not. The GPU buffers already had this mechanism, but the rendering loop was still checking tiles individually. With this update the stress on your CPU is much much lower, especially on higher rendering distances. I had no problems getting steady 50-60fps on my laptop on the integrated graphics chip with 80-100 RD. This gives the game also more time to focus on loading and keeping a more stable fps rate. You will no longer see it change that much by changing your camera's angle. Why am I doing this? I felt like the game wasn't running too well on weaker laptops and wanted to improve the situation. Please let me know if this change improves overall performance for you! For comparison: The base damage of the Ice barrage spell is 30. The damage of wave spells has also been nerfed to better fit their level requirement. Prayer potions remain unchanged. They restore 7 prayer points plus your max prayer level multiplied by 0.25. Super restore potions no longer restore run energy and 8 prayer points plus your max prayer level multiplied by 0.25. Run energy restoration should be on energy potions. Energy potion remains untouched, but the super energy potion now restores 20% run energy instead of 15%. You can now make super prayer potions that restore 7 prayer points plus your max prayer level multiplied by 0.35. They are now the best source for restoring prayer points. Super prayer potions can be made by putting large demon bones into a prayer potion (3). Prayer renewal: Restores 12 + max prayer level multiplied by 0.43 over 5 minutes. It can be created by combining Morchella mushrooms and Fellstalk potions. The new ingredients have been added to Farming, Herblore and monster drop tables. The Fellstalk herb and its seeds is dropped by high level Slayer monsters that dropped torstol herbs or seeds. The Morchella mushroom seeds can be found as rewards from the Barrows minigame. I was also able to find a list of pretty much all missing song ids and was able to patch a few areas where the song id was missing. So in theory it should be possible to configure all 352 songs at some point. I now also have the ability to add custom song names to the music list - Blood altar being the first example. I've reviewed and reworked the effects of enchanted bolts a little bit to make sure they are useful in PvM and PvP scenarios. They will not out damage ancient bolts, but can be useful in various situations. I also identified and fixed a bug where bolt effects would not correctly show their application animation on players. Sapphire bolts (e): Reduces enemy prayer points by 10% of your current prayer points. You also steal half of the reduced enemy prayer points and add them to your prayer points. When fighting monsters this effect restores 2 prayer points. Emerald bolts (e): Inflicts 3 poison damage that can stack up to 15. Ruby bolts (e): Now deals 20% of enemy's current health instead of 10%. This is still capped at 30 though. Diamond bolts (e): Completely ignores the enemy's defence and guarantees a hit. The damage is also increased by 15%. Dragonstone bolts (e): Ranged strength bonus reduced from 116 to 108. Onyx bolts (e): Ranged strength bonus reduced from 116 to 110. While Crossbows give you great damage they are over performing when compared to other weapons or combat styles. I don't think crossbows themselves are the problem, but enchanted bolt effects. I didn't want to nerf the attack speed of crossbows, but I am changing the proc chances of enchanted bolts. By default the proc chance is now 15% instead of 20%. Onyx & Dragonstone bolts (e) were reduced down to 10% and emerald bolts (e) increased to 30%. The reason behind this change is that onyx bolts (e) were even stronger than ancient bolts while also providing a free heal every few hits. Dragon bolts (e) have the potential to deal 24 additional damage (assuming active Overload potion) allowing you to hit 80+ quite frequently. They have a natural counter with antifire potions, but I don't think it should be necessary to require PvPers to have them with you all the time. A small reduction in their max hit and proc chance should solve the issue and bring more variety to Ranged PKing. Teleblock is now halved when mage protection is active. There's now also a chatbox message telling the duration of the teleblock. The animation timings have been updated for teleblock and all bind spells. This is only a visual improvement! Restoration pool now properly restores prayer points. It also acts as a chaos altar boosting your maximum prayer points by 10% for 5 minutes. Monsters can no longer die in the middle of a teleport or special action. That means you can no longer kill any of the Demon bosses while they perform a jump or are flying across the map. This fixes an issue where minions spawned by Har'lakk would never despawn. Har'lakk no longer spawns random minions during the fight. To cope with this change the HP of minion spawns have been increased from 75 to 90. Spirit shield protection special has been updated. It now blocks any kind of incoming damage, also deflections from vengeance. Bows firing 2 arrows now require at least 2 arrows in your ammo slot or quiver. Certain fully degraded items are no longer duplicated. Several clue scroll places for digging that could not be accessed have been fixed. The 2nd hit of a special attack now counts towards the Pest Control total hit counter. Morrigan's javelin special attack has been updated. The special attack damage multiplier was reduced to 125% from 135%. The initial hit now deals the full special attack damage and applies a bleed effect of equal damage. The bleed effect no longer ticks in 6 total hits. It has been changed to hit 5 onto your opponent until the total damage has been dealt. The bleed effect now ticks every 1.5 seconds instead of every second and is registered as magical blood damage. This means you can use the Protect from Magic prayer to reduce the bleed damage. It's also possible to stack bleeds now. The damage of stacked bleed effects will be combined and tick as higher damage. So if 2 players spec you the bleed will tick every 1.5 seconds for 10 damage instead of 5. Morrigan's throwing axe special attack max hit buffed by 10%. The stat restore effect of Overloads has been weakened for PvP zones. This excludes minigames but includes the safe wilderness in Al'Kharid. Overloads restore up to 6 missing levels of lowered stats every 2 seconds. In PvP zones they will now restore up to 2 missing levels of lowered stats every 2 seconds. The idea behind this change is to make stat lowering special attack weapons and effects not worthless while still being able to use the overload effect for brew healing. Combination runes now properly show their amounts for Magic interfaces. NPC aggression inside minigames has received a little adjustments. Monsters now always walk up to the player inside the Fight Caves minigame. Prior to the update they would just wait at their spot when not seen by the player. The Italian boot safespot has also been fixed. Unclippable cell doors inside Rogue's castle have been removed. A bug was fixed where fully degraded weapons that got unequipped were deleted when there was no space in inventory. They now correctly drop on the floor. A lot of actions can now be used when being 5 seconds out of combat instead of 10: Quest tab teleports, trading, banking, skillcapes, skilling, xp lamps, etc. Zaryte bow now has an accuracy bonus of 124 instead of 106. It should have never been weaker than God bows. Vesta spear special attack: The special attack delay has been removed and the damage is now applied in 2 immediate and 1 delayed hit. Vesta longsword special attack max hit increased by 5%. Statius warhammer special attack max hit increased by 15%. A lost vyrewatch necklace (b) upon death now drops remaining vampire blood on the ground. You can now smith range and magic variants of the dragonfire shield. They come with different colors and appropriate combat class bonuses. Butterfly nets can now be properly equipped again and used for catching butterflies. Daily tasks can now include Hunter and Construction skilling tasks. PvP kills have also been added to daily activity tasks. Construction skill interface now also contains all required building materials. Random events can no longer spawn inside objects. Spell effects no longer have double the accuracy to hit. Prayer bonuses for Templar set have been doubled. You no longer hear an armour block sound, but the player hurt sound when being hit by an enemy hitting non-zero on you. The Armadyl godsword special attack damage has been buffed by 5%. Teleporting now also cancels all incoming spell effects. That means that you can no longer be teleblocked, frozen, etc. during a teleport animation. Special attack cost for Zaryte bow and Seercull have been reduced from 75% to 60%. Holiday quests no longer count towards the completion requirement of the Completionist cape. A visual bug with dragon claws was fixed wher the 3rd and 4th hit sometimes would not be shown. Position of amulets has been finetuned. There was an issue with amulet of glory on female black dragonhide body. Scrollbar rendering has been improved. The up/down arrows now have a hover action and the chatbox scrollbar buttons have been fixed. Using the mousewheel to zoom or scroll an interface will now also work with uncapped fps rates. Moving interfaces has received a few tweaks. You can no longer move an interface over the chatbox, minimap or inventory. An issue with the running animation for staves and whips has been fixed. Clicking areas for ground aligned npcs have been improved. The rotations were only done in the GPU but left out in the CPU for hovering and clicking checks. The model on the CPU is now aware of its full rotation. The quality and smoothness for interpolated rotations in animations has been improved. Clicking areas for small objects and npcs now dynamically increase to make it easier to be able to click on small things. Interface scaling now uses interpolation and looks much smoother. Certain artifacts of text or images not blending in correctly have also been fixed. You should no longer feel like your UI looks very blurry when using that setting. Clicking areas for fixed-screen mode have been fixed. Invention skill: deconstruction of items to obtain materials that allow you to craft powerful utilities. These could aid you in combat, improve skilling, improve xp rates, etc. Fully accessible Karamja: A quest that introduces Karamja including the jungle and Marim (Ape atoll). The map would be configured with new skilling activities and a fully accessible Karamja area. OSRS players & nps: This would update the visuals of your player and npcs (where possible!!) to look similar to OSRS characters. Having the same map is an impossible task, because of all the differences in positions. I'd basically have to rewrite the entire game to achieve that and I doubt that'll ever be worth the effort and time. What could be done is to introduce OSRS maps as new and separate areas. We'd have 2 versions of the GE, barbarian village, etc. However I feel like this would be really confusing and also unnecessary. I've already started this project a while ago, but stopped due to the amount of issues and bugs that occurred graphically and logically. Would this still be a thing? 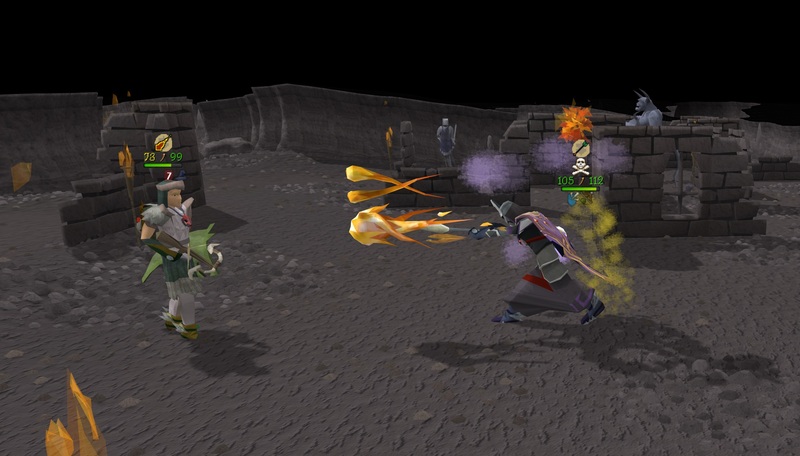 Fight kiln - a new single player minigame with 3 new capes as reward. I've listed a few things that I've thought of recently and have been planned in the past. What are your thoughts on this? What would you like to see in the game this year? Not all things mentioned above require an equal amount of development time. I'm just interested in the rough direction updates should be going. Runes from the Rune bag no longer display double for Surge spells. Teleport to House now grants Magic experience. Prayer renewal potions can now properly be noted and their effect is stored when logging out. Prayer restoration upon death is now properly working. Morchella mushroom spore plantations can now properly be interacted with. There was a bug that wouldn't let you rake them from special angles. Restoration pool and staircase Construction daily tasks have been removed. The tutorial NPC Thomy in Barbarian village was fixed. You can now either correctly abort or play through the tutorial. The login code has slightly been adjusted. Some people had issues when logging into the game. I've slowed down the login process by 2 seconds to ensure no data corruption or disconnect happens during that time. Do not worry about this - Unless you are fully logged in nobody is able to see you!! We can give this a test and change it for PvP only? However I really do feel like a system where prayers are instantly taken into consideration feels buggy without the opportunity to counter something. I'll have a look how enchanted bolts perform in the next patch and look at further adjustments if required. I could see reduction in their ranged strength bonuses. Regarding the tankiness of Ranged - equipment bonuses are the same for every combat style. You probably won't be beating a Ranger in Magic gear, but you have much better chances with Melee. I don't think Magic necessarily needs to be buffed offensive-wise. I rather discuss the spell effects instead of just pumping more damage into it. The ancient spellbook seems fine imo, barrages bring great utility for many different scenarios. The lunar spellbook offers the Vengeance spell and also allows you to auto-cast offensive spells from the nomal spellbook. What I could see changed is adding a new tier of offensive spells to the normal spellbook: for levels 80-95 Magic with similar strength as compared to Ice barrage. Regarding Ranged: How is it op? Tankiness? Isn't this only about bolts being so strong that you can stack a lot of defence bonuses while holding a crossbow and shield? Could a reduction in the combat power of bolts solve that problem? Or a reduction on the proc chance of enchanted bolts? Keep this discussion fair and factual - I really don't want wish to start moderating posts here. We are talking about the power of items here and not individual fighting styles. That sounds like a great solution - only 1 active combat prayer at a time. No, it shouldn't ruin magic other than giving you way lower chances to freeze in non-mage gear. It'll apply the spell effect when not splashing. Spells have double the accuracy to apply their effects. That was changed in a previous update due to a large amount of complaints about the exact opposite: spells not hitting. We can just revert it and have another topic popping up a few months later complaining about the same thing again. Whatever... I will revert it, because it the solution wasn't very intuitive and is no longer necessary with the current bonus system. Also the tests with barraging npcs in melee armour are quite unfair, because there is no difference if you barrage them in melee gear or not wearing anything at all. There's no negative bonuses! Amulets, certain gloves and boots give quite decent magic offensive bonuses that allow you to be able to hit your enemy with spells. Will be fixed! Many thanks for the video. Is there a placeholder for degraded version in tabs 5-12?